We are a reliable manufacturer and exporter of a wide range of Soapstone that is synonymous with Potstone. It can be regarded as a slightly inferior variety of soapstone. 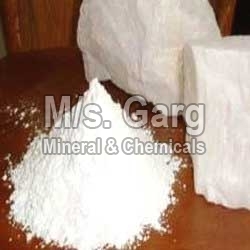 It forms the base of many cosmetics and toilet preparations in which the absorptive properties of mineral is utilized. Our assortment of Soapstone is high on demand in the market and is priced competitively. The pure white quality of soapstone after grinding to powder is known as â��French chalkâ�� in trade. Its production mainly comes from Udaipur, Dungarpur, Bhilwara and jaipur districts of Rajasthan and chittor district of Andhra Pradesh. Especially French chalk is in great demand and India exported it mainly to Kenya, Norway and U.K. It is mainly used for carving out pots bricks. It is employed as linings for various kinds of stoves, ovens and fireboxes. Sawn blocks of soapstone are used in wood pulp and paper mills as lining for the alkali recovery furnaces and kilns and tanks. Bricks made from crushed soapstone, bonded with silicates of soda are used for the manufacturing of furnaces in which crude lead is softened. Its use in manufacturing of pesticides and for coating calcium ammonium nitrate (fertilizer) has been developed.